Does Jordan Eberle Only Score Against Bad Teams? If one peruses through the Edmonton Oilers online community of fan pages and blogospheres, you’ll find some interesting debates. One of the discussions online is whether or not Jordan Eberle only scores against bad NHL teams. 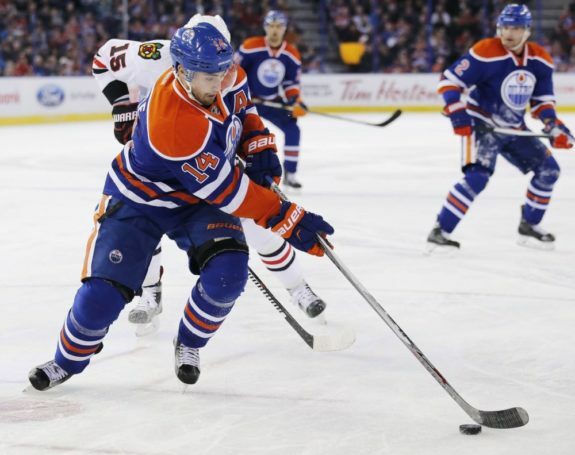 Eberle, 27, had his lowest scoring season in the last four years and went goalless in 13 playoff games this spring. With a $6 million dollar price tag, having a goal scorer who puts up just 20 goals is a massive cost. He had an exponential dip from his 0.33 career goals per game (26 goals per season), dropping to 0.24. But if Eberle scored six more goals this season, would we still see his name in the rumor mill? If we look at Eberle’s goal scoring tendencies, after every “down year” he bounces back. There’s more to should Edmonton trade Eberle debate than just goal scoring, but that’s not what we’re discussing. We’re talking about his goal scoring because that’s where Eberle’s value is. We’re going to run two tables on Eberle. First we’re going to calculate his goal scoring trends. Second we’re going to graph out his scoring against playoff, non-playoff and even bottom five teams. If we adjust Eberle’s goal totals and account for the differing number of games he’s played each year (injuries etc.) we get a fair understanding of his estimated total over each 82 game season. We’re going to run a table based on his goals per game (G/GP) from each season to see his scoring trends. 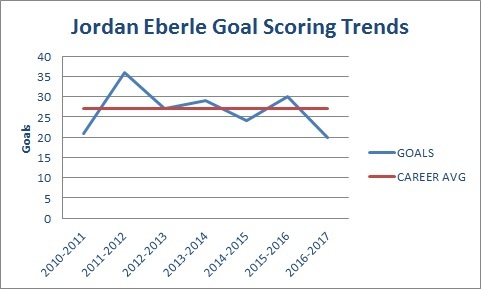 What we can draw from his goal scoring trends is that this was arguably the biggest drop in scoring from Eberle since 2011-2012 to 2012-13 (0.44 G/GP to 0.33). That said, put an asterisk next to that goal drop because he scored at an 18.9 shooting percentage (S%) the year he scored 34 goals. Eberle’s career shooting percentage has been 13.4% so that 18.9% was an unrealistic number to maintain through his career. So, in reality, Eberle’s drop between 2015-16 to 2016-17 (0.36 to 0.24 G/GP) is the most significant of his career. Conventional wisdom would suggest that a player is within their prime until around age 30-32. So, Eberle still has another three-five years of prime scoring production. But judging by this graph, the question becomes; is Eberle an inconsistent scorer from year to year or is he a declining asset? Does Eberle Only Score Against Bad Teams? If you break down Eberle’s scoring tendency’s this season, it doesn’t bode well for his play against some of the better NHL clubs. Eberle managed just seven goals in 42 games against teams that qualified for the playoffs. Against non-playoff teams, including the bottom five clubs in the league, Eberle scored 13 goals in 40 games. Breaking it down even further, Eberle seemingly lit the lamp against the five worst teams in the league with nine goals in 17 games. Looking at these numbers, it’s not surprising to see why Eberle struggled in the playoffs. Through ten regular season games against both the San Jose Sharks and Anaheim Ducks this year Eberle was also goalless. In fact, against all Western Conference teams that qualified for the postseason, Eberle scored just five goals in 26 games. If the Oilers played the Calgary Flames or Nashville Predators all the time maybe we wouldn’t be having this discussion. 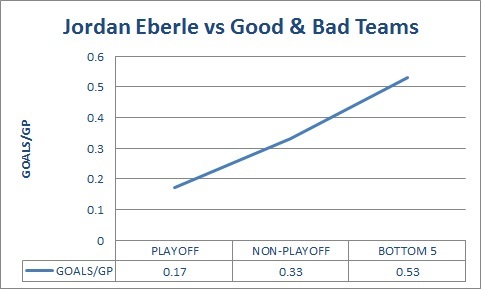 The data speaks for itself, Eberle struggled against playoff teams but did exponentially better against weaker teams. The worse off team, the better Eberle played. So what does it all mean? For the long term, if the Oilers want to contend for the Stanley Cup, they need consistent scoring in their top six against good and bad teams. After all this time, we’re finally coming to the realization that Eberle might not be that clutch scorer Edmonton needs. Then again, maybe it was a down year and next year he’s back on track contributing his career average of 26 goals per season. There have been plenty of rumors surrounding the Oilers’ heavily priced forward, and the latest have him linked to the New York Islanders. Could we see a swap that brings Travis Hamonic to Edmonton? What about a deal with the Colorado Avalanche that sends Tyson Barrie to the Oilers? 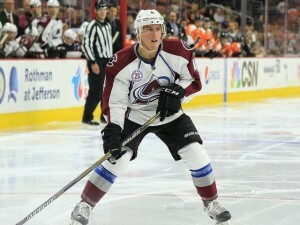 The Avalanche have said they’d like a defenseman back in either trade for Barrie or Matt Duchene. Then again Sami Vatanen (Anaheim Ducks), Jonas Brodin (Minnesota Wild), Matt Dumba (Minnesota Wild) and Chris Tanev (Vancouver Canucks) are all rumored to be available. Eberle’s stock has never been lower, so trading him this summer might backfire considering he’s bounced back after a poor season. The flip side of that is a lot of teams might be willing to lower their asking price considering every team is bound to lose at least one good player to the Vegas Golden Knights in the expansion draft. However you slice it, whether Eberle’s here next year or not, he needs to find a way to contribute against the upper echelon of competition.